An easy introduction to raised bed gardening. 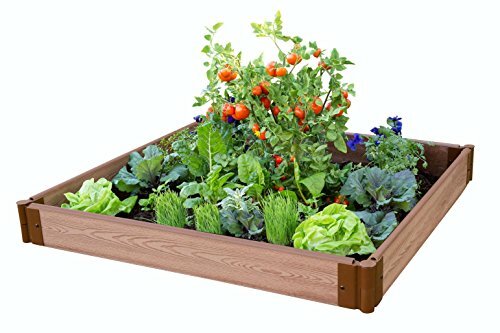 This raised bed planter is the perfect place to start developing your skills and experience the joys of growing your own vegetables. With 16 square feet of available planting area there is room to grow a good assortment of your favorite veggies, herbs or flowers. As your garden needs and expertise grow you can add on to your modular raised bed any time by purchasing additional 1” kits, boards or stacking brackets to stack or extend your garden. Curved 1” boards are also available to incorporate into your design. Our Raised Garden Bed Stacking Brackets pivot 270 degrees, allowing endless design options. Your 4’ x 4’ square raised garden bed can be converted to a diamond shape just by changing the angle of the joints. You can grow up to 16 different plants inside your 4’ x 4’ garden using “Square Foot Gardening” techniques. There are countless books and online resources available to guide you in this rewarding method of gardening.